It’s a headline that inspires false hopes about politicians finally getting their comeuppance. “Wall Street’s Pile of Unwanted Treasuries Exposes Market Cracks,” Bloomberg reported a week ago. 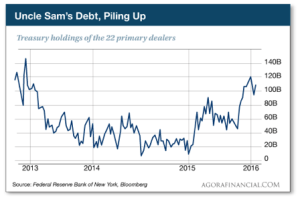 It seems the U.S. Treasury’s “primary dealers” are saddled with more Treasury debt now than at any time since October 2013. 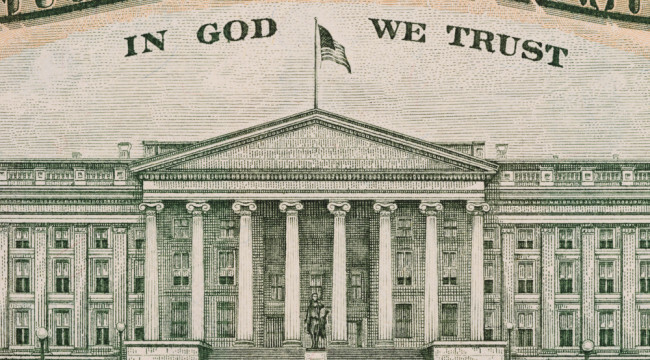 The primary dealers are the 22 big banks and trading firms required to show up at Treasury auctions in exchange for a host of special privileges with the government and the Federal Reserve. The backwash is accumulating partly because foreign central banks are unloading Treasuries at a record pace — $105 billion in December and January. It’s so easy — and tempting — to draw the wrong conclusions from this story. Hold on, pardner. Once again, you’re falling into the trap of “just world” investing. Yes, if it were a just world, no one would want U.S. Treasury debt and TBT would be a sure bet. If anything, these developments signal lower yields and higher prices on Treasuries. Nearly a year ago in these virtual pages, Jim Rickards described a discussion he had with a banker who works with the Treasury Borrowing Advisory Committee — a private group that meets regularly with Treasury and Fed officials to grease the wheels of the Treasury market. Much of that is a function of new rules put in place after the Panic of 2008. Government regulations being what they are, the effect has been to make the system more risky, not less. But in the event of a dislocation, the most likely result is another “flash crash” like the one that occurred on Oct. 15, 2014 — when the yield on a 10-year note suddenly collapsed — sending prices higher — and then rebounded. The real problem lies in the spillover effects — as Jim described to us last year. The repo market rate is close to the fed funds rate — that is, still less than half a percent. Meanwhile, 10-year Treasuries have traded with a yield-to-maturity of 2–3% since 2013. That’s a handsome spread for a primary dealer who buys 10-year notes and finances them in the repo markets. Leverage the trade 10:1 and the return on dealer equity can be north of 20%. Sure enough, stresses are showing up in the $1.6 trillion repo market — according to that very same Bloomberg story last week. Long story short, in the three weeks since, these stresses appear to have abated — this time. But Jim anticipates one day there will be another flash crash in Treasury rates that won’t bounce back — setting off the next financial crisis.